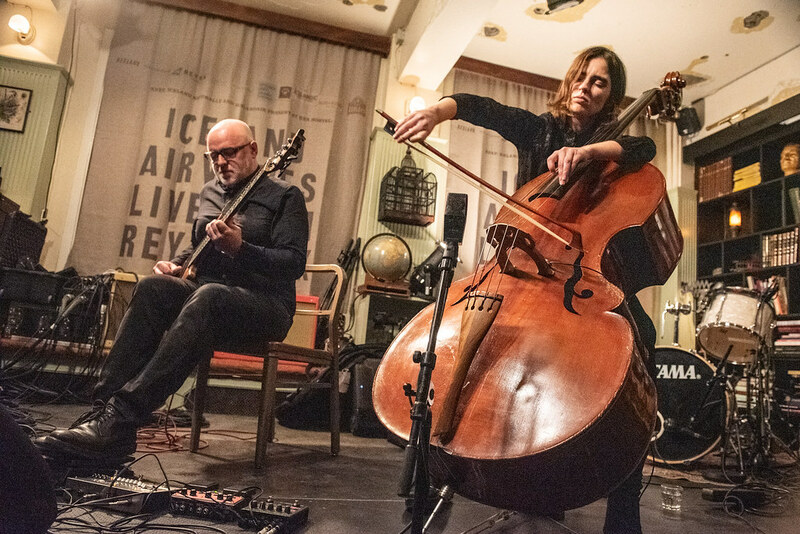 Our second performance of the day here at the KEX Hostel in Reykjavik, Iceland was yet another thrilling debut of a collaboration between two renowned Icelandic artists – Bára Gísladóttir and Skúli Sverrisson. But before we get into the performance, a little bit of background is due for these exceptional artists and their musical pedigree. Gísladóttir is a phenom in the Icelandic classical music community with her reputation and works extending internationally. The 28-year-old composer got her start early, studying violin as a child and eventually studying composition at the prestigious Iceland Academy of the Arts. She’s still studying composition, currently at the Danish Academy. Still, at the ascent of her career, she boasts performances with The Danish National Symphony Orchestra, The Danish National Vocal Ensemble, Duo Harpverk, Elektra Ensemble, and numerous others. Sverrisson has long established himself as a master of his craft. 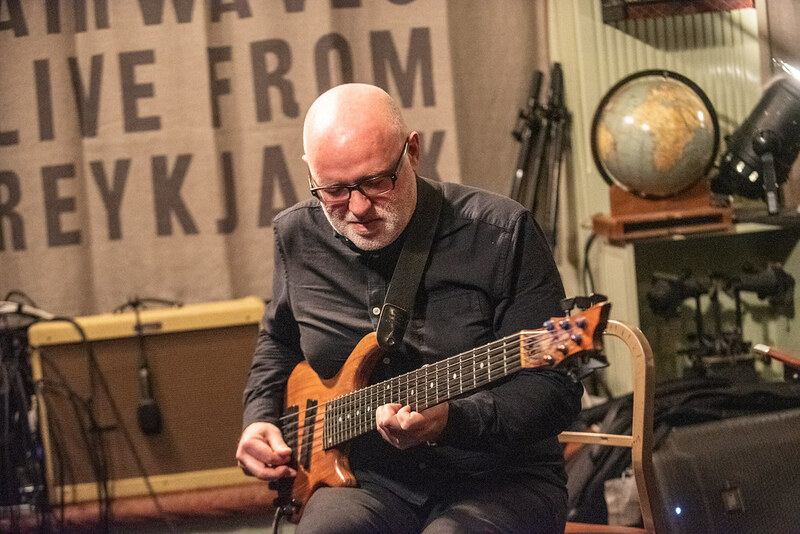 The composer and bassist is a go-to collaborator for the likes of Lou Reed, Blonde Redhead, Ryuichi Sakamoto, Laurie Anderson, and his late Icelandic composing peer Jóhann Jóhannsson, among many others. He’s scored dances and films, produced his own albums, and seems to be in constant pursuit of new artists to work with. His upcoming project with Gísladóttir is a testament to his still growing desire to seek out new talents and sounds. This isn’t Sverrisson’s first time performing for KEXP either, check out the dreamy acoustic performance he fronted way back in 2009 below. 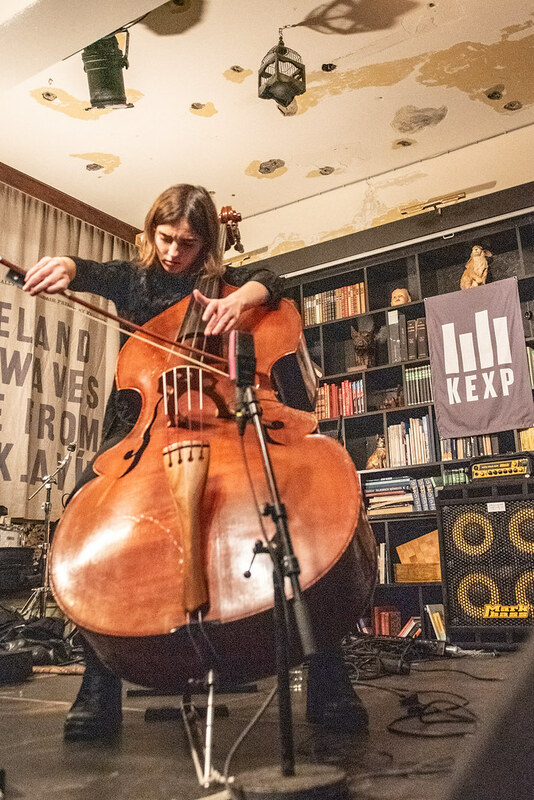 Recordings of Gísladóttir and Sverrisson’s collaborative works have yet to materialize, making their performance at KEX a special treat. 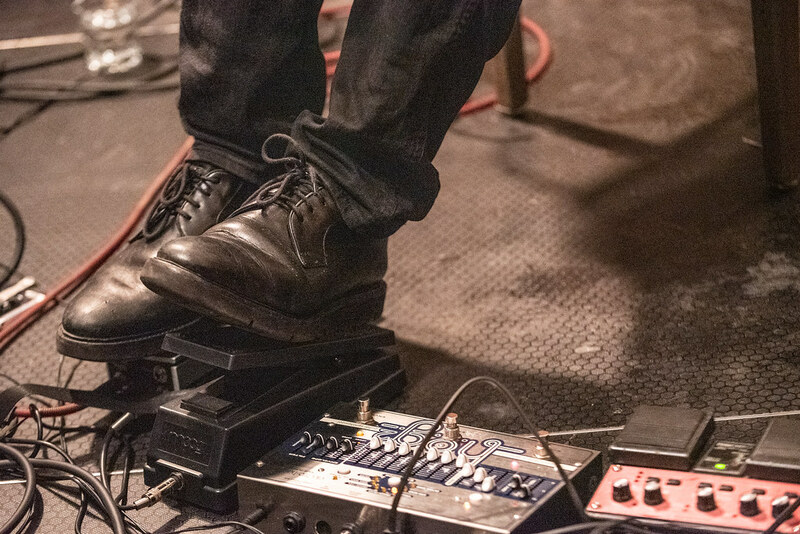 Their set was completely improvisational, creating their cacophonous sounds right before our eyes. The two hardly ever connected their eyes while they played, but never did they feel out of sync. What's even more astounding is how the two blended so well while taking drastically different approaches with their instruments. 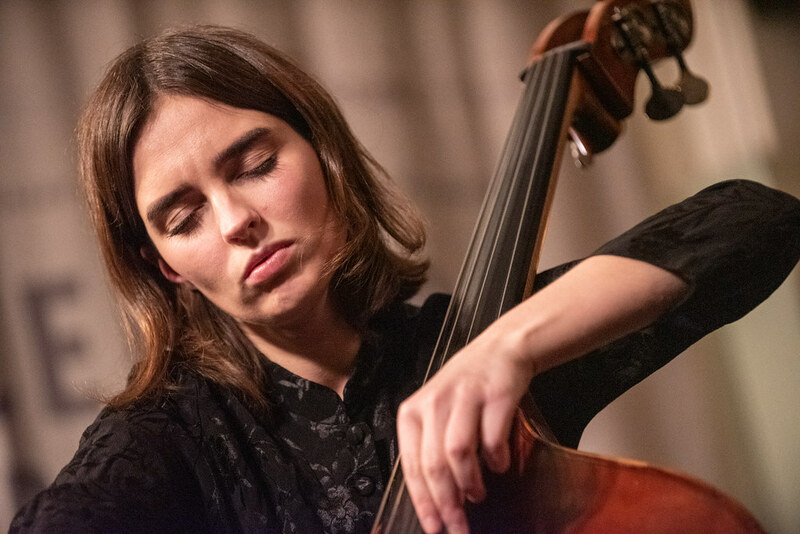 Gísladóttir's playing is immensely physical, gripping her double bass with icy intensity. In her hands, the instrument screeches, twists, and contorts and fills the room with its powerful bombast. Her eyebrows flicker when she hits a particularly gnarly note. Or notes, as is often the case. The chords she'd manifest are harsh and unfamiliar, a delightfully alien sound. Her movements with the bow felt like a saw, grinding against the strings as if to cut through the strings. In contrast, Sverrisson's playing was almost tender – although still decidedly ominous. Playing a six-string electric bass, he'd steadily pluck the strings and create a wondrous rumble. His notes would bellow in the room, echoing at a tone that hit your body like a bad feeling in your gut. It was like a premonition of danger, the parts in a film score that warn you that things are about to get dicey in the coming scene. 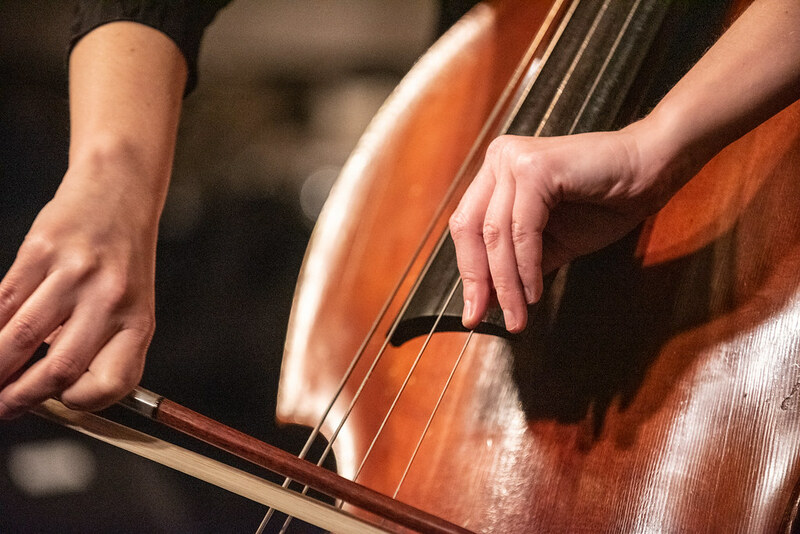 The contrast of him moving so effortlessly with his fingers on the strings and frets – soft and fluid, never strenuous – to the ominous sounds he was creating was striking, to say the least. KEXP kicks off our Iceland Airwaves broadcast with a debut of new music from former GusGus member Stephan Stephensen and Icelandic composer Óttar Sæmundsen. Check out a video playlist featuring some of the artists performing at the Iceland Airwaves Music Festival, happening Wednesday, November 7 through Saturday, November 10 in Reykjavik, and find out how you could win a once-in-a-lifetime trip to attend! Iceland Airwaves Music Festival share the first wave of their line-up, including international acts like Blood Orange and Snail Mail, as well as Icelandic acts Mammút, Hatari, and more.